If you missed Part One, you can read it by clicking here: More Than a Makeover–Part One. 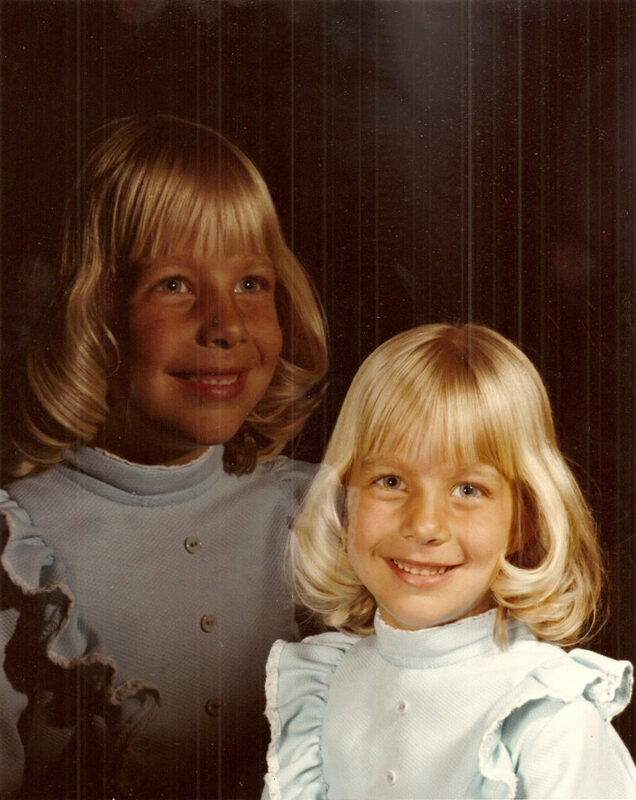 I was not an attractive child (despite what my mother might say). Oh sure, I was cute up to a point. But then my baby teeth fell out, and it was all over. 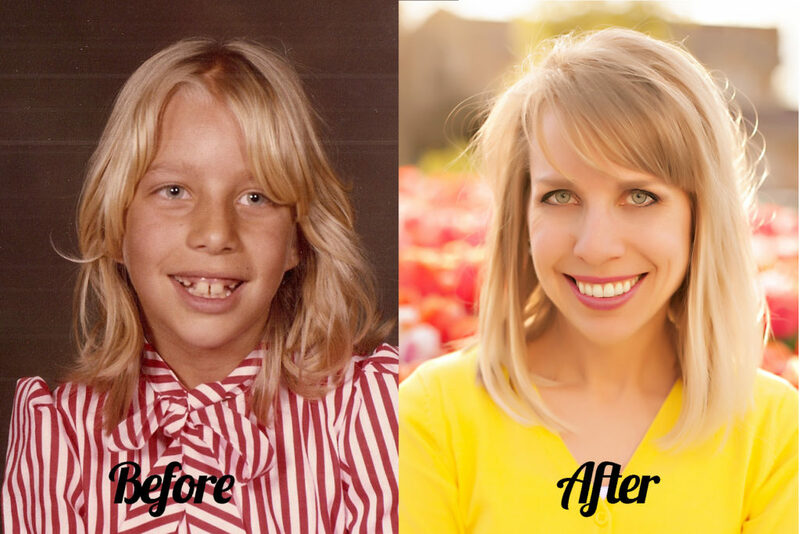 I got huge front teeth with an enormous space between them, along with a marvelous overbite. As I got older, things got worse. I got in a terrible bike accident which broke my nose (and they didn’t fix it at the hospital because they said it wasn’t done growing yet). I started noticing the two large moles on my face (which I liberally applied Clearasil to because I thought they were pimples and desperately hoped they would go away). 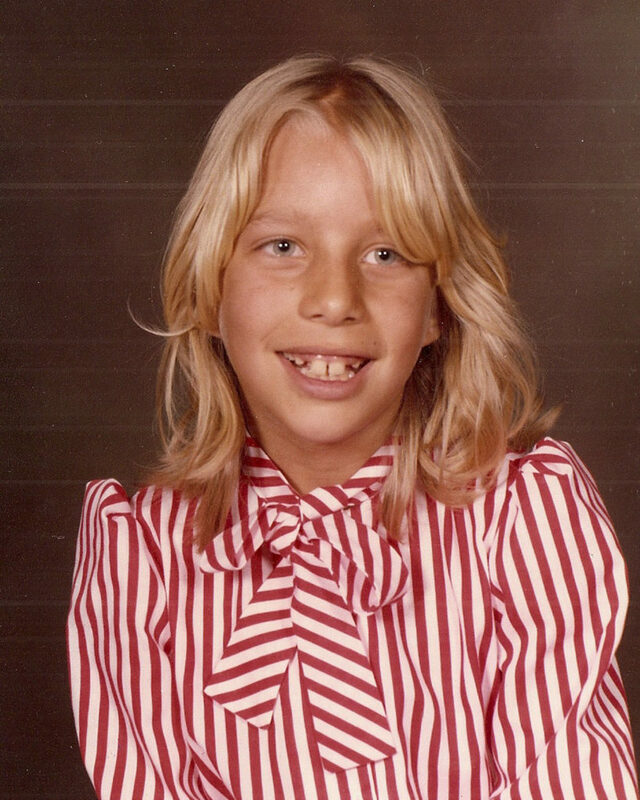 I had a cow lick right at my forehead, and the unfortunate timing to stumble into puberty when feathered bangs were all the rage. 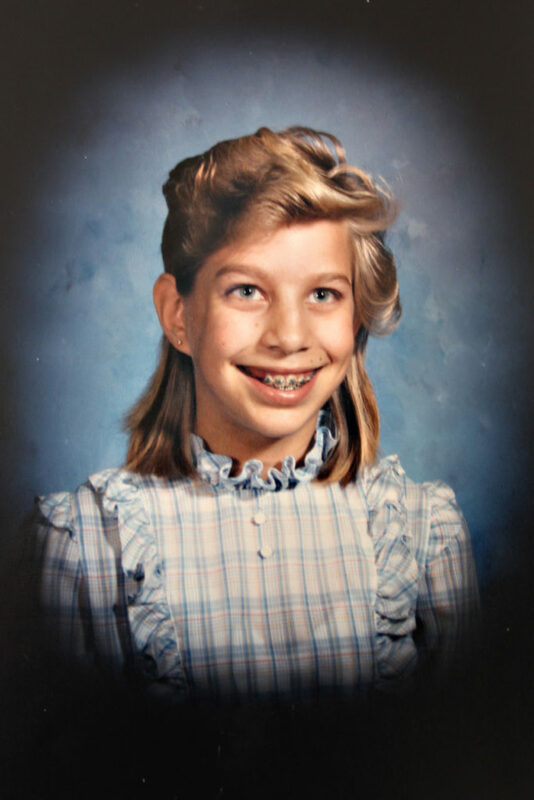 I did get braces, but went through a series of hair mishaps that are comical, but only in a very sad, pitiful sort of way. Like you can’t help laughing, but you feel bad about it because you are imagining the scorn I endured in my tender, formative years. One time in high school, I was showing one of my best friends all my school pictures in order from kindergarten to the present. 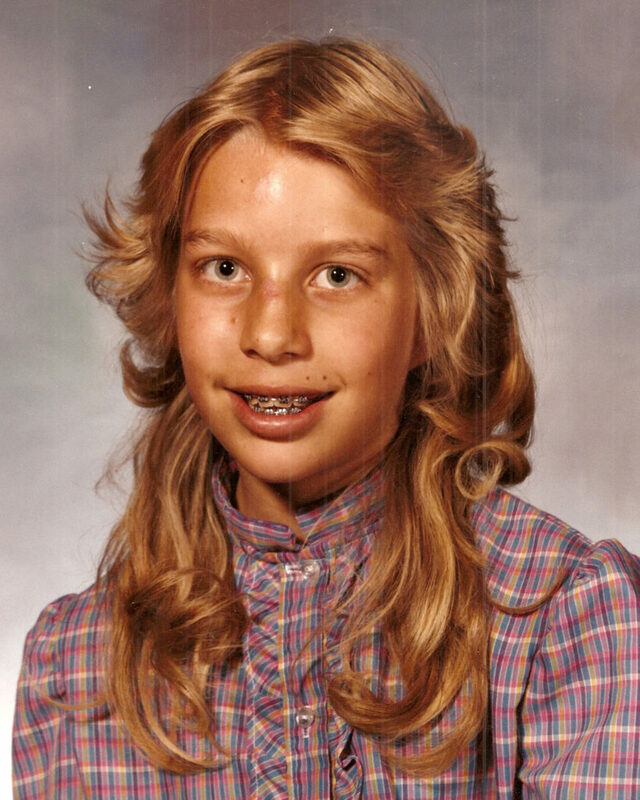 By the time I got to the picture of me at age 13 (shown above), she was laughing hysterically and rolling on the floor clutching her stomach. “No more!” she begged. “Stop! Stop!” (I am not making this story up). Needless to say, I should have had therapy because of all this. My guess is, except for a lucky few, many of us (particularly women) have had similar experiences. Lots of us still have things that we hate about our personal appearance. Many of us just can’t seem to get over our “flaws,” either internal or external, and it keeps us from being the best possible version of ourselves. Despite people saying that “appearance doesn’t matter,” I think that it does. It matters to YOU. I know that when I look good, I FEEL good. I wanted to know how to look beautiful every day. I wanted to stop getting unflattering haircuts and stop wasting my money on “fashionable” clothes that just didn’t look good on me. This program is not a one-size-fits-all makeover program. It is customized to women based on their energy type. For an explanation of the four different types, but sure to read Part One. That means that your makeover will not be the same as your mother’s or your sister’s or your best friend’s. It is just for you! The first thing I had to do was figure out which type I was. You can do this, too, by taking a free online course, or by reading “It’s Just My Nature! ” by Carol Tuttle, the creator of Dressing Your Truth. I read the book (which I highly recommend, because it goes very in-depth in describing each of the four types). Not only did I discover myself in the book, but I also gained huge insights into my husband and children which helps me every day give them the kind of love and attention that they each need. Before discovering my type, I had suffered through my life with feeling like I should be something other than what I was. People were always telling me to smile more. I was told that I was intimidating, and I later found out that people in high school thought I was a snob. Neither of these things was true at all! But the way my energy expressed itself (very still and quiet) was misinterpreted as intimidating and snobby. I had strong opinions, but kept them to myself unless I felt the time and audience were right for sharing them. I also could never fake my feelings–pretend everything was o.k. when it wasn’t. I hated working in groups, and going to parties or dances was so incredibly uncomfortable for me. I considered myself to be a kind, compassionate person, but socializing with strangers was agony! I wasn’t broken afterall! I didn’t have to be the life of the party! I was not intimidating and snobby! All my perceived “weaknesses” could actually be strengths! I had special gifts to offer that were just from me! And what I wore on the outside could resonate with who I was on the inside. I am a Type 4, a Bold, Striking Woman. Once I learned this, I went through the Dressing Your Truth Program and have never looked or felt the same. I found healing for long-held faulty beliefs about myself, and now I know how to look and feel great, every day. 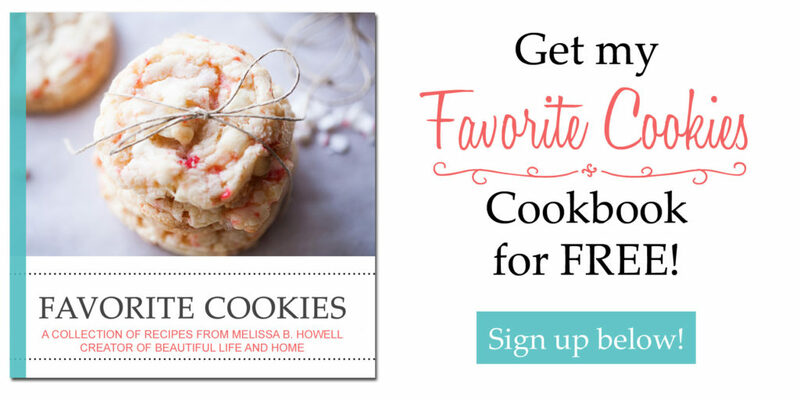 To pin this post, please go back to page one and click on the Pinterest button at the top of the post. I just went through and read the posts here. I thought this was ice cream blog, but I was blown away by what an exceptionally good writer you are. You really have a gift and more than anything you care about your readers and you care about others. You are full of wisdom and grace. Thank you for sharing what you have learned!!!! Becca, thank you so much! I admire you as well for your wisdom and grace. You are truly one of the loveliest people I know! I love that you introduced me to Dressing Your Truth. I feel so beautiful and shopping is a breeze! We all have horrible younger year pictures! Sounds like a great program! When I first saw you, I thought you were a 2, soft and subtle. But I am not an expert. Besides, it seems no one wants to be a 2. Paula, that’s so funny. I thought I was a type 2 at first, also. And I REALLY wanted to be a type 2! I thought everybody wanted to be a type two! (I am a secondary type 2). What type are you? Hi Melissa, Of course, I don’t know your personality, but I just pictured you in soft and subtle colors. I am a 2, and sometimes feel like no one wants to be a 2. I suppose they are afraid of being ignored. Princess Diana was a 2, so I guess I can identify with her. So,what made you change your mind and determine you are a 4? I was reading It’s Just My Nature and I got to the Type 2 section and thought, “Yes, that’s me.” Then I got to the Type 4 section and thought, “No.THAT’s me!” And in my experience when I first introduce this program to people, they all think they are a two!